When the Forty-first (1974) General Assembly of the Orthodox Presbyterian Church met on the campus of Trinity Christian College in Palos Heights, Illinois, it was a big change. For the first time, the assembly met on a college campus, not at a local OP church or at Westminster Theological Seminary in Philadelphia. The commissioners stayed in dormitories, not in homes of members, and ate in the dining hall, not in a church’s fellowship hall with meals supplied by the local congregation. 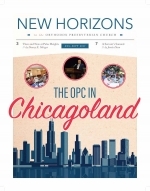 On a hot afternoon in the suburbs of Chicago, more than two hundred deacons, elders, and pastors from OP congregations across the country hunched over plates of barbecue and settled into visiting with each other on a lawn in front of a residence hall at Wheaton College.